Welcome to Precision Powersports home on the internet. We are located off Miller Road in St. Louis, Missouri, right in the center of everything. 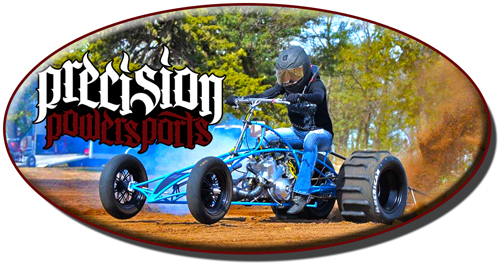 We are a leading manufacturer of aftermarket sand drag ATV frames, build nationally recognized and award winning race motors, and carry any part you can imagine for your motorcycle and ATV at the best prices. Whether you want something as simple as a set of wheels and tires, pro-level port work, or a one off drag quad, we can do it. So browse around, look at some of our parts, and get in contact with us on your needs. If, however, you do happen to have a competitors price that is lower than our listed price, let us know and we will do our best to win your business.